Fischman in the discus circle, competing on spring break in March. 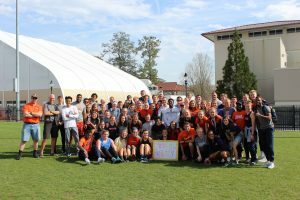 There inside an eight-foot, concrete circle with a discus white-knuckle-gripped in her right hand, it was not readily apparent that Hope College’s Haley Fischman ’18 was coping with cancer. 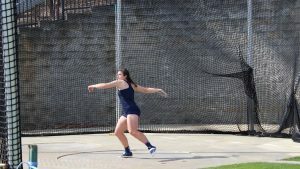 The senior student-athlete struck the pose of a skilled thrower ready to propel two pounds of wood and metal and carbon fiber ridiculously far through the air and seemed much the same as she had hundreds, maybe thousands, of throws before. Well, maybe there was one exception, one new item added to her usual orange-and-blue Hope uniform that betrayed her new reality: this time, on the first day of the 2018 Michigan Intercollegiate Athletic Association Track and Field Championships in early May, Fischman wore an unassuming cream-colored bandana over thinning brunette hair. And not just at that moment but also a day later. 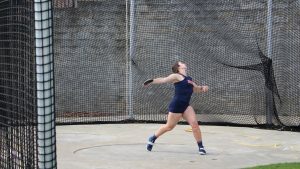 Fischman’s all-out effort and that fourth-place-resulting discus throw accounted for five points, just enough for the Hope women’s track team to defeat Calvin College by four and a half points (179 – 174.5) over the course of the two-day meet and thus win the MIAA championship. Here’s the added kicker (as if knowing she has cancer isn’t a gut-punch enough): Haley Fischman was not even supposed to be there. Two surgeries and chemotherapy initially, understandably discouraged her from going. Here’s the added kicker (as if knowing she has cancer isn’t a gut-punch enough): Haley Fischman was not even supposed to be there. Two surgeries and chemotherapy initially, understandably discouraged her from going. But go she did, pulling off a championship-difference-maker after her third infusion of sickening and weakening chemo nine days prior. Fischman has been receiving a hopefully-curative-but-potent concoction for Hodgkin’s lymphoma every other week since late March. She also has a chemo port on the left side of her chest. But what she mostly has is an indomitable spirit and a deep Christian faith, and her fortitude and charismatic, infectious smile signals a young woman at peace in the fight of her life. Cancer’s timing and presence are always an inconvenient truth. 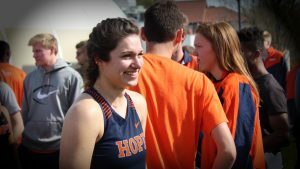 Fischman was diagnosed with the hateful disease in February, just after the indoor track season, one week before outdoor season and two-and-a-half months from graduation. The driven and goal-oriented 22-year-old had plans, and plenty of them: to win the MIAA in discus during the outdoor season, to qualify for the NCAA championships, to travel to Zambia and serve as a missionary with Pōětĭce International for the summer of 2018, and then to enroll in graduate school in genetic counseling in the fall. 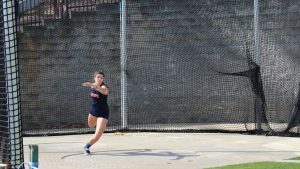 But Fischman just could not forget or give up on her first dream of the season — to win a MIAA championship in discus. The thought of literally throwing one early success in cancer’s face was a huge motivator for a young woman who has an uncanny knack for exhibiting confident moxie and compassion all at the same time. “When she sets her mind after a goal,” says her father, Paul, “it’s ‘Damn the torpedoes full speed ahead.’ You gotta love it.” But first, she had to get clearance from her doctors to blast her own personal torpedo. The Flying Dutch and Dutchmen dubbed themselves Team Haley on spring break. Fischman’s presence did not weaken the team; in fact, it helped make them champions. Indeed, the Flying Dutch won the 2018 title in one of the closest meets in MIAA history. It could be argued that, out of all the points the Hope women’s team accumulated, the five points that Fischman secured from her first-day, discus performance (she also finished 10th and scoreless in both shot put and javelin on the second day “and I was not too happy about that!”) were the jolt the Flying Dutch needed to claim the league crown. Her presence did not weaken the team; it helped make them champions. 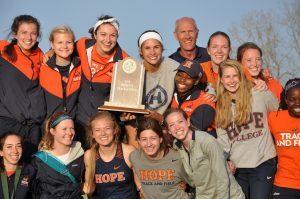 Fischman, left center, holds the MIAA trophy with teammate Alison Rich, right center. Fischman hopes to finish chemotherapy soon, with radiation to come, and in that as well she’ll continue to embrace the mantra she adopted early in her cancer journey: “to be faithful, not fearful” taken from Isaiah 41:10. Many in the Hope community also have that tenet wrapped around their wrists. On the April night of the annual HOPEYs Awards that honor outstanding and inspiring performances by Hope teams and student-athletes, Fischman received the Karen Page Courage Award given in honor of Hope’s long-time women’s tennis coach who ended her brave, five-year battle with breast cancer in the summer of 2009. 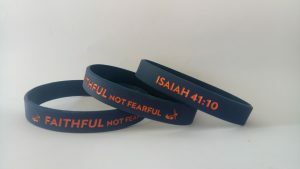 In a gesture of solidarity, 400 orange-and-blue “Faithful Not Fearful” wristbands were offered to those in attendance. Every single one was taken; more had to be ordered to satisfy demand. 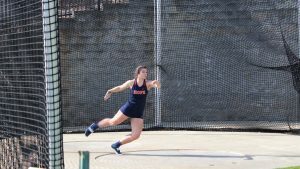 Like a trip to the NCAA championships, Fischman’s summer excursion to Africa will not occur either, but the funds she raised for her summer experience are now helping to support three local Zambian interns instead. Even in her absence, more faithful expressions are moving the kingdom of God a continent away. One last Fischman goal will not be sidelined, however. The self-proclaimed biology nerd who graduated with honors (and a 3.68 GPA) has every intention of enrolling at University of North Carolina-Greensboro this fall for a master’s degree in genetic counseling. Her doctor has again cleared the way and Fischman again is ready to go. If Haley Fischman has taught us anything, it is this: Always admire the visible and invisible. Appreciate the strength and faith found in both body and soul. So, the next time you marvel at athletes’ physical talents, consider too the state of their spirits. If Haley Fischman has taught us anything, it is this: Always admire the visible and invisible. Appreciate the strength and faith found in both body and soul. We leave our reading carrying our care. And maybe that care can be carried into healing. Thank you Eva. And oh my yes THANK YOU, Haley!! !